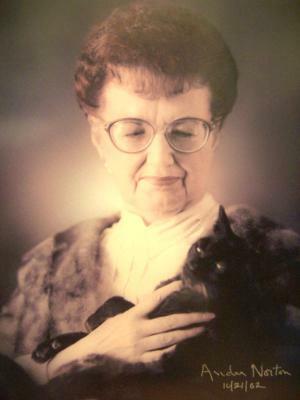 The Science Fiction Writers of America site reports that Andre Norton, “Grand Dame of Science Fiction and Fantasy,” died yesterday morning at the age of 92. She was never my absolute favorite writer, or one that I returned to very often, but I do remember some wonderful experiences with her writing when I was a kid. And that’s what she really did well…SF (more fantasy) for “young adults.” It’s a difficult audience, and she did a great job of reaching out to them. And I think that her books brought a lot of young women (as readers and writers) into a field which (especially in those days) was almost exclusively “boys’ books.” And she was a cat person, too, which is overwhelmingly common in SF circles, for no clear reason I can think of. In any case, RIP, Ms. Norton. Oh, wow, she was probably the author that got me into science fiction! I remember being in elementary school and reading practically all of her books from the library!